The birth of Hyderabad is rooted in two legends. One is the early teen love affair of Prince Mohammad Quli with Bhagmati, a beautiful singer and dancer. The other is the decree issued by him as the sultan of Golkonda that a new city should be constructed which should be replica of heaven. When the city was ready, he named it Bhagnagar after his beloved Bhagmati. Over the five centuries following its founding in 1591, numerous new legends have come to be associated with the city, its rulers, and people. Legends and anecdotes are generally considered as the gossip of history. However in some cases they are also the stuff of history. It is not easy always to separate chaff from the grain. It was not very long ago that oral history was acknowledged as a source of history. The author has written extensively on the history and culture of Hyderabad. Here he presents a selection of some interesting legends and anecdotes relating to Hyderabad which, despite their traditional spice and flavour, are rooted in facts. The 'legendotes' as he calls them form a chain of gripping snippets from the history of Hyderabad. This liberally illustrated volume thus provides an absorbing glimpse of the history of a city much celebrated for its romantic origin and composite culture. It will be of interest both to lay readers and students of history. Narendra Luther is a former top civil servant who kept his hobby of writing intact all through his career. He occupied the high table of humour for a long time and organised the world Humour Conference in 1985. His four books and numerous articles in Urdu won him seven awards. For close to half a century he has written extensively on the history and culture of Hyderabad and is regarded as an eminent authority on the subject. He has published a number of books on Hyderabad and the Nizams. He is also contributing author of a number of books and has written columns for The Hindu, The Times of India, and the Deccan Chronicle. Some of his books and numerous other writing have been translated into some other languages. Do not rush to Google to seek the meaning of the little of the book. There is no such word. I have coined this compound noun by amalgamating two terms Legends and Anecdotes. A legend is a story from old times about people or events, which may be true or not. An anecdote is a short, interesting, or amusing story about a real person or event. This book is about both these, which I have come across during my life, which was largely lived in Hyderabad and researches. However, I have checked their truth or historicity as far as possible. The matter within therefore is verifiable. Apart from published sources, I have also done considerable work in the oral history of Hyderabad. That related to matters for which there is no published source. For example the story of Kasim Razvi is drawn on the testimony of his most devoted and steadfast disciple, the late Zahid Ali Kamil. He was himself a prosperous lawyer and had very good health at eighty – one when I met him. I was lucky with him because according to him, I seemed to have helped him in some matter when I was the head of the Hyderabad Municipal Corporation. He was initially reluctant and said that he wanted to write Razvi's story himself. I said that Razvi was a person on whom different views could be taken and so different books written. I also told him that he had not done that so far, and hinted very politely that he did not have much time left to do that. Once he was convinced he came forth with the minutes details of Razvi's life before the latter's conviction, after his release from jail seven years later and finally leaving Hyderabad after thrusting the president ship of the Majlis-e-lttehad-ul- Musalmeen on a reluctant latecome. Another interesting example is the Legend of Seven Kulchas connected with the legend of seven generations of Nizams ruking in Hyderabad. 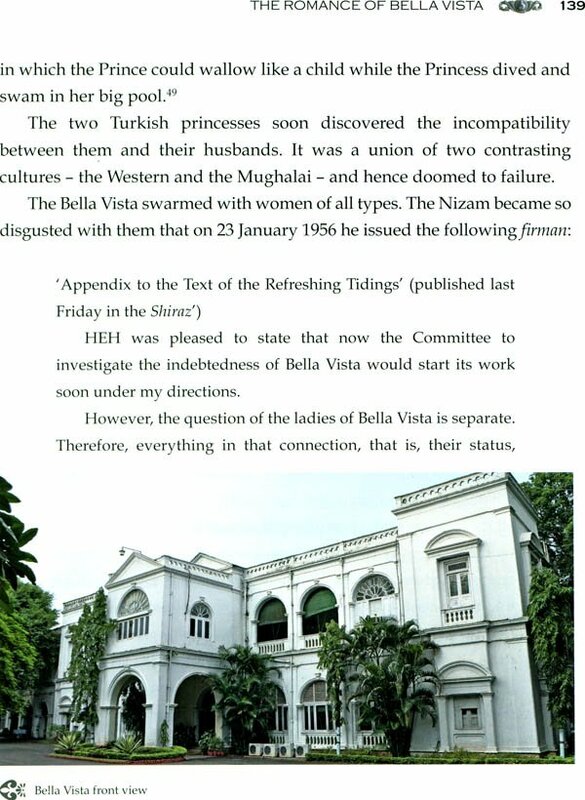 The first Nizam whom it relates to himself contradicted it on record. Despite that, even his progenitors believed it. We have a record of the sixth Nizam approving the design of his flag based on that legend. In short, I submit that thelegendotes in this collection are factually correct. On the highway of formal history, legends and anecdotes do not get their due credit. However, much of the crucial facts and causes of historical developments lie scattered about in the lanes and by lanes of history. They are therefore a material factory in any historiography. I hope that the reader of this volume will feel that they have read an episodic history of Hyderabad and have savoured the mood swings of the city and participated in its moments of triumphs and tragedies. Having said that, let us turn to the subject in hand. I will being with the historical background. Alauddin khilji defeated the Kakatiya dynasty of Warangal in 1323CE. The Tughlaqs followed the Khiljis on the throne of Delhi. Mohammad Tughlaq's local centurions, rebelled against him for his tyrannous and cruel rule, and established the Bahmani kingdom in 1347. The Bahmani kingdom started breaking up in late 15th Century and five sultanates rose out of its smouldering ashes. The last to do so was the governor of Tilang (Golkonda) province, Sultan Quli in 1518. He hounded the Qutb Shahi dynasty with its capital at the fort city of Golkunda. There were eight sultans in the dynasty. Mohammad Quli Qutb Shah became the fifth and the most illustrious ruler of that dynasty at the age of named it Bhagnagar, after his beloved Bhagmati. Our stories begin from the founding of the city. In 1687, the Mughal emperor Aurangzed defeated the last Qutb Shahi ruler, Tana Shah, and merged the Golonds sultanate in the Deccan province of the Mughal Empire under a Governor located at Aurngabad. Mir Qamaruddin Khan was the Nizam –ul –Mulk (Prime minister of the Mughal Empire). When he defeated Mubariz Khan, and became the government of the Deccan in 1724, the Mughal Emperor, Mohammad Shah meekly acknowledge his position and conferred the title of 'Asaf Jah' on him. Mohammad Shah acknowledged his position. He virtually became independent without declaring his new status. The 'Asaf Jahi' dynasty is thus dated from 1724 CE. He is counted as the Nizam and his successors bore the same designation. They are ten in number but only seven are recognised, because the title of Asaf Jah covering the period 1748 to 1762. Out of the rest, the first, the sixth, and the seventh Nizams are best known. The rule of the Asaf Jahi dynast ended when India took Police Action against Hyderabad in 1948. The state of Hyderabad then became a part o India. After the first General Elections in India in 1952, Hyderabad had got its first popular government. In 1956 Hyderabad state became a part of the new and enlarged state of Andhra Pradesh, and the city of Hyderabad became its capital. Feudalism generates more legends than democracy because the lives of leaders in a democracy are more open to public scrutiny. They thus lack the air of mystery associated with the inhabitants of Camelots. I have arranged all the legendotes chronologically and given relevant citations for them. A few entries arebased on the verbal testimony of what I believe are very reliable sources. For ease of timeline reference, I have appended the relevant dynastic tables in the case of the first two sections and agter the start of the democratic order, names of chief ministers in the third section. I thank many friends and sources quoted in this book. My special thanks are due to Dr. Nagender Reddy, Director of the Salar jung Museum, Hyderabad, for his unstinting help in providing information and rare images to embellish my text. My young friend Sbhishek Patel, by hobby a culinarian (skilled in the preparation of food and interested in its ancestry), and a keen lensman, not only opened his treasure of rare images for my use, but also went out to locate and click elusive targets in sizzling heat. I am very grateful to him. I thank my old friends Neelamegham, kesavan and Sarvar for their crucial help which I always take for granted. Last, but not least, I would like to thank Nitasha Devasar. She handled two of my earlier books very competently, and was responsible for bringing me to Niyogi Books this time. I have enjoyed the interest and care with which this book was handled in its raw form by the Publishing team. Now, welcome to the fairyland of Legendotes.